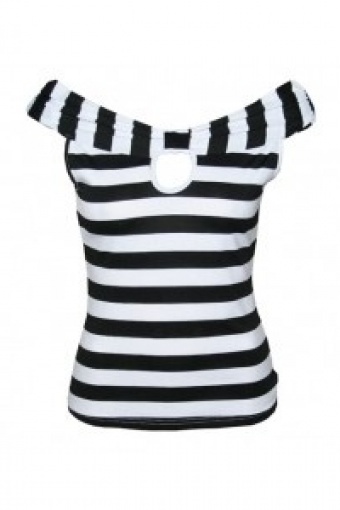 Brigitte keyhole boatneck top Black White stripes from Collectif. This must-have basic is a real cutie! Made from a light and supple jersey coton stretch. This sleeveless boatneck short top is as comfortable as it is cute! It can be worn with jeans, or tucked unto a pencil skirt for a truly classic look. Features include a fitted silhouette and a keyhole on the front. The model wears the Hilda skirt in Red.